The Monimoto GPS tracker is a relative newcomer to the motorcycle tracker market and it’s going up against some well-proven rivals. It packs a raft of features but it has one ace up its sleeve; it’s wireless and can be up and running in minutes. There are other wireless tracking devices available but the vast majority of them use GPRS (a phone signal, which can only give you a rough location estimate, accurate to about 1-mile). The Monimoto features GPS, so you can get a highly accurate fix to within a couple of metres of your bike’s location. There are no cables to solder in, no professional installation required – you can be up and running in minutes. It measures just 125mm long by 35mm wide and in-hand it feels about the same as gripping a throttle and it has the weight of an electric toothbrush. Billed as a smart alarm, the Monimoto has taken advantage of improved battery and GPS technology to pack a lot of tech into a neat and small unit. There’s also a small instruction leaflet and a disc-shaped card that reminds you to head to the App Store (Apple) or Google Play (Android) to download the Monimoto app. You pair the device with the app, then you place the device somewhere secure on your bike. The Monimoto comes with a fob and it arms once the fob isn’t in range. Once the fob is within range, the unit deactivates again, saving battery life. If the device detects movement, it waits for 15-30 seconds while it searches for the fob. If it is unseccessful in contacting your fob, it will call you (normally within 30 seconds). It’ll then activate the GPS functionality and send its GPS co-ordinates to your app, showing the device’s location (within 60 seconds). The app shows you all the alerts and plots all locations on a Google map, so you can follow its path. Updates arrive between every 5 and 10 minutes while the bike is moving. If it loses GPS signal it will use GSM location (which is not anywhere near as accurate). When the device thinks it is in the same location it reduces the updates to every 30 minutes, so save battery life. The unit operates separately to the bike, so it doesn’t need wiring in or access to your bike’s power supply. Because the unit isn’t ‘on’ all the time, Monimoto claim an impressive battery life of up to 12 months for the supplied CR123A lithium batteries. Quality replacement CR123A batteries only cost a few quid from Amazon too. The Monimoto unit combines GPS and GSM technology. The GPS unit in the device logs GPS co-ordinates and these are then sent to your phone via the SIM Card on a GSM (2G) network. The unit has pre-formed holes, big enough to fit a two chunky cable ties through, meaning you can easily attach it to a secure area on your motorcycle and just as easily transfer it between bikes. There is no monthly charge. However, the SIM card provided gives you two months of use for free and after that you pay €3 a month (via the app) to carry on using the SIM provided. If you don’t want to pay this, you can switch to your own 2G SIM and if you choose a PAYG package, you’ll be able to run the Monimoto with no ‘monthly charge’. Setup should be a doddle but if yours goes wrong, just pull the batteries out and start again. The setup is straight forward. Although like with anything that involves a phone, technology or indeed electricity, it can go wrong and – if it does – it’s best to switch it off and switch it on again. You download the app for your iPhone or Android device. Then open up the Monimoto GPS tracker, remove the tab across the battery terminal to activate the device. You crack open the fob with a small flat-head screwdriver and remove the tab covering the battery in there too. Then you open up the app, sit all the gadgets close to each other and work your way through the instructions. The process is as the image above demonstrates. It’s simple: you get sent a text to confirm Monimoto has the right mobile number (as this is the number it calls and texts with updates). You then pair your Monimoto to your phone and then pair the key to the Monimoto. Et voila! All being well, you’ll be up and running in 5 minutes. The beauty of a tracker is that thieves don’t know which bikes have them fitted. Which one of these has a tracker fitted? You’ve got a 50/50 chance of guessing correctly. You can locate your Monimoto anywhere and thanks to the pre-formed holes, you can easily secure it with the cable ties provided. It goes without saying but I’ll say it anyway: for the Monimoto to be efective it has to stay with the bike. If you fit it in an easy to find location, thieving scumbags will find it, ditch it and be off with your bike. Don’t fit it under the rider’s seat, as some thieves will rip these off just to see what’s under it. Choose a good location but remember you’ll have to replace the batteries from time to time and so the trade off here is to find an effective location and one that doesn’t involve you stripping your bike down to change the batteries. The GPS unit is located at one end of the Monimoto and this is marked on the casing, so ensure this is facing upwards (towards the sky). I’ve concealed mine using electrical tape, so it doesn’t look like something that has been ‘bolted on’. The fob is vital to the Monimoto setup. If the bike moves and the fob is out of range, it activates the Monimoto into contacting you. You could locate the fob on your keys and that would do the job however their are two issues here. Firstly, the fob isn’t waterproof and so if you ride in all conditions, it’ll quickly knacker the fob and probably render your Monimoto useless. Secondly, if your bike is stolen with the keys in the ignition (often known as bike-jacking and thankfully it’s rare at the moment) you won’t be able to activate the Monimoto and see where it is. So I recommend you keep your fob on your person, zipped into an inside jacket pocket for example. You can pair up to 3 fobs to your Monimoto tracker (they can be purchased separately for £29 each). So you and your partner can each have a fob, for example. Or you could have a fob in each of your bike jackets (you swanky thing). A really nice feature is that if you have multiple Monimoto units (i.e. 3 bikes with a unit on each bike), you can pair your fob(s) to all of the devices. So you ‘only’ need one fob for all your bike. Neat. We carried out two different tests. We simulated a typical city-centre motorcycle theft. Using our scooter, we parked it in on the street and ensured the fob was out of range. We spent 30 seconds shaking the bike to simulate breaking the steering lock. We then pushed it 100 metres down the road. We recorded the time it took for the device to wake up, alert us by phone and initiate its tracking functionality. Then 40 seconds later, we were sent another alert: ‘Alarm! GPS coordinates available‘. When clicked on this event and it opened up Google Maps, where it showed a marker for where the bike was. It was exactly right, accurate to within a few metres. We wanted to see if a small amount of movement piqued the Monimoto’s interest. Just how sensitive is it? 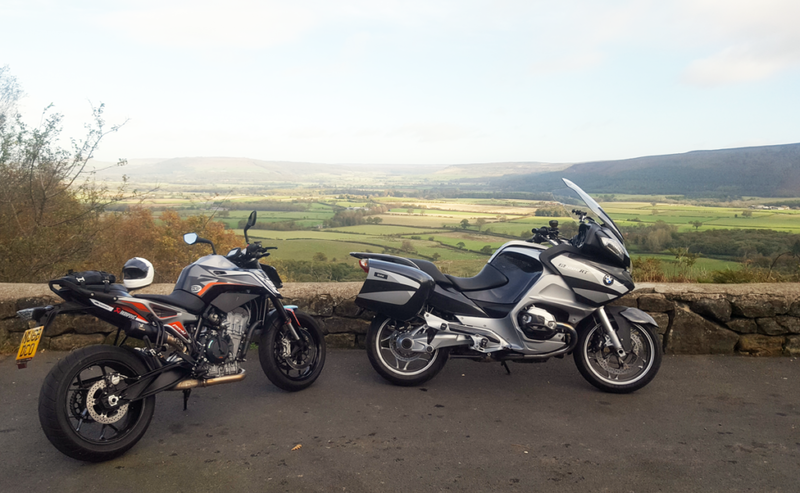 We set the tracker up in the glove box of our BMW R1200RT and then moved the key out of range, so the tracker armed itself. I then slightly wobbled the bike by opening one of the panniers and waited 30 seconds to see what happened. If this didn’t work, I would progressively move the bike more to see when the tracker kicked in. The plan was: open pannier, sit on the bike, pick it up off the side stand, wheel it away. Within 40 seconds, the Monimoto was calling us. So the simple act of opening the pannier and slightly jarring the bike made the Monimoto sit up and take notice. Impressive! Monimoto is self-monitored, meaning that if your bike is stolen, you do all the tracking and the leg work to find it. If your bike is fitted with BikeTrac, any alerts go through to their HQ and a call center will alert you via a phone call, SMS and email and also liaise with the police. It doesn’t feature RF technology. While most trackers have GPS and GSM, they can be rendered inaccurate if the bike is in a van or stored in a container or underground car park. The BikeTrac system uses radio frequency, which means an operator can go to the last known location and pick up the RF signal if it is within a 1-mile radius. Monimoto is self-fit and simple to setup. Wired GPS trackers almost all need a certified installer to set it up, which isn’t a burden but some people will just want to get on with it. 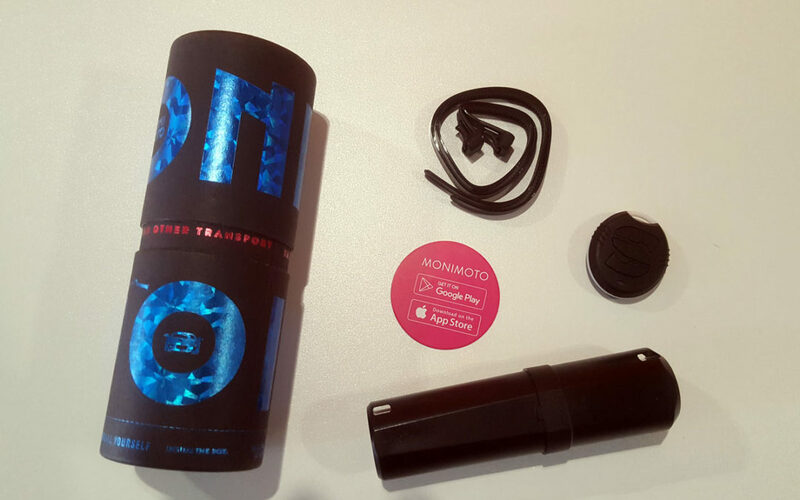 You can move the Monimoto from bike to bike whereas a wired-in GPS motorcycle tracker is a more permanent fixture. Monimoto doesn’t require a subscription. If you stick with Monimoto’s SIM, you’ll pay 3 euros a month but you can switch to any PAYG sim and a lot of these only require a £5 top-up every 180 days. That said, BikeTrac is only £99 for the year, which works out at just 27-pence per day. Monimoto won’t get you an insurance discount. With no approvla rating, Monimoto isn’t a security feature that’s officially recognised by any insurance companies. BikeTrac is Thatcham Category 7 approved (the highest level) and will get you a discount (approximately 5%) from your insurance policy. Would I recommend the Monimoto motorcycle tracker? Definitely. There are many reasons to buy a tracker but the biggest one for me is: peace of mind. As I type this, I know that my bike is in my garage, exactly where I left it, exactly where I want it to be. If my bike moves, I’ll know about it. If I can”t get there in time to stop it from being moved, I’ve got a good chance of being able to locate it, before the thieves can determine whether I have a tracker and more importantly, where my tracker is located. There are other trackers on the market that offer a higher specification, like BikeTrac for example, but I’ve been using the Monimoto for over a month now and it does exactly what it’s intended to do; by keeping me in the picture. If, like me, you have more than one bike, one of the key benefits of a battery powered GPS tracker like the Monimoto is that it is portable. I can transfer it between bikes fairly easily – although the more hidden away the tracker is, the less chance you have of thieves finding it, so it’s not a good idea to put it under your pillion seat. It takes me a couple of allen keys and 10 minutes to swap the Monimoto between bikes. If I’m taking a bike away for a weekend, I can swap the Monimoto and put an extra chain on the bike that I’m leaving behind in the garage. Monimoto is getting lots of great customer feedback. You can see more customer reviews on the Monimoto page here and see the device’s full spec and some commonly asked questions and answers. Buy one today and you can have it up and running on your bike tomorrow. Don’t you just love technology?